Replacement: None. We are no longer carrying these ICs in our catalog. This page is for reference only. Want to sound like a robot? 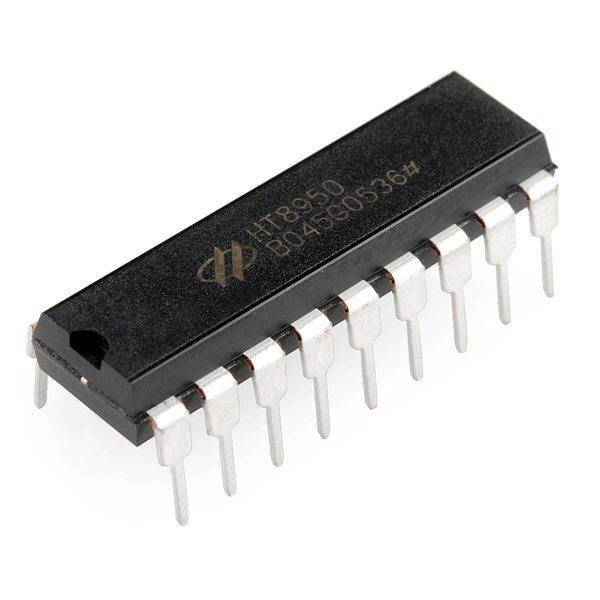 The HT8950 is a single chip CMOS LSI voice modulator ICs which provide seven steps to shift the frequency of an input voice, producing a dramatic change in the output. The HT8950 provides two special effects: vibrato and robot. The vibrato effect is generated by alternating the frequency of an input signal up and down at a rate of 8Hz. The robot function, on the other hand, converts an input voice into a robot voice. Both effects can be selected depending on which pin is triggered, either ROB or VIB. For the output frequency level shifting, the chips provide seven steps which can be selected from the two groups of pins namely, SW0, SW1 and SW2 for electronic direct selection and ROB, TGD, TGU and VIB for push button selection. We are working on a video for it as we speak (in robot voices of course). We'll show you what it can do. So, you guys get around to making that video (in robot voices) yet? I searched Voice Modulator on your YouTube channel and came up empty! Has anyone managed to get this IC to work in an actual project? I tried one of the sample circuits in the datasheet and got nowhere. Oddly, there's a "TS" pin that the datasheet says is "For IC Test Only", yet every one of their example circuits has a boatload of connections to this pin. From the description, I would think it was a "no connection" unless you were making some sort of test point on a board. In fact, on the example circuits, the only path from VCC to the chip's VDD pin is via all the stuff they have connected to the TS pin. Somebody please shed some light on this thing! Can we have BOTH FX AT 1NCE?! Can it do Peter Frampton + Dalek? AD633 with a 24-32hz sine or triangle wave fed into the the carrier (various chips for this) and a mic into the other inputs + a amp and a few passive components make a good ring modulator for the Dalek voice. Hey guys, if I already have the bob mic https://www.sparkfun.com/products/9964 and mono amp https://www.sparkfun.com/products/11044, do I just bypass all the stuff in the datasheet? Do I just go from the AUD pin on the mic to the Ain pin on the HT8950? And the same for the Audio pin on HT8950 to IN on the amp? Then just hook up regulated power, 2 pots for Frequency and Vibrato, and four switches? Aw man, sampling rate only 8kHz... so will the frequency output start folding down past 3999 kHz because of the Nyquist effect, or is there internal protection for that, to mute those sounds above 3999 kHz? The mic amp feedback is brought out (pin A0) so you can create a low pass input filter (see the datasheet example circuits). 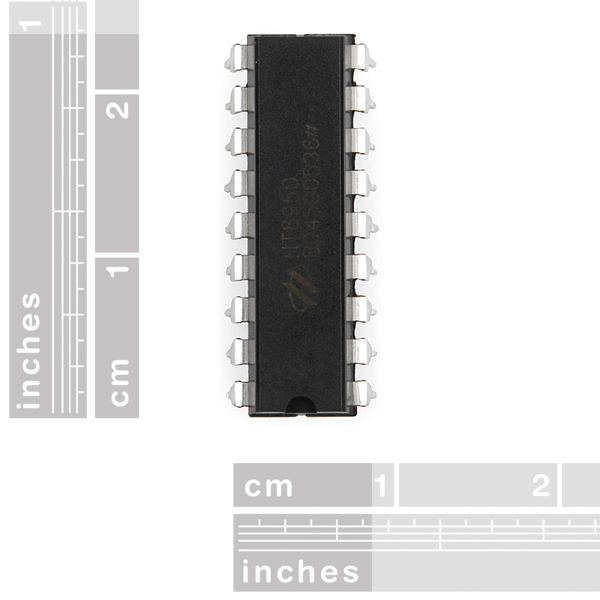 This chip (or it's little 16 pin brother) is available in various kits that include the microphone, switches, audio output amplifier, etc. (e.g. the Vellman MK171 which is about $13). Can't believe a vocoder actually comes in a through hole package. It really does have ROB & VIB pins in the datasheet. China must also have a late night talk show chip, with Bin Laden & Clinton pins to select the jokes. Fantastic! I was looking through a list of audio chips last month and this one was my favorite, and now you've got it! Most specific chip that isn't an ASIC ever? "The robot function, on the other hand, converts an input voice into a robot voice." That's great, but is there a more technical explanation for the robot function? Does it use a pulse modulator or resonance or ... ? Are we talking Cylon or Dalek? EDIT I just RTFDS, and it appears there is NFI. Have any Sparkers had a chance to play with this? I did a youtube search on the part number. This is the chip to get. One guy made a guitar effects pedal with it. agreed - it even makes an LED blink!